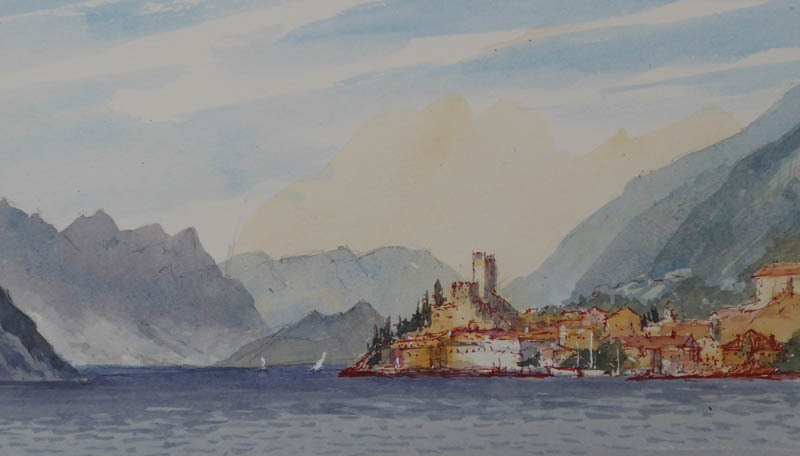 Many people find watercolour difficult to control – in fact, most of us do at times, and it can be especially frustrating for those folk who enjoy and are good at drawing, but want to turn their drawings into watercolours. One excellent method of achieving this is to use the wash and line technique, where you draw the image in ink – laying down a preliminary pencil drawing if you are not confident to begin straight away with the pen – and then lay watercolour washes over the image. In this scene of a fishing boat I began with a fine fibre-tipped pen, drawing in the boat, ropes, bird and beach features, then once the outline was complete I worked in the tones by hatching with the pen, more intense in places, such as the underside of the craft, mainly by drawing the hatching lines closer together. When all this was done I washed colour over the image, weak washes, as the tone was already there, apart from the sky and one or two other parts. Pens are not especially good for creating interesting atmospheric skies, so I did use the wet-in-wet technique to include clouds and a darkened lower sky, but it could have been left as a plain weak wash, and the same applies to the beach. On the cabin I did lay a medium-toned blue-grey wash for the shadow side, although I could have hatched it lightly with the pen. Of course, you can simply do the drawing without any hatching and then lay washes in the usual way, mixing darker tones where needed, so there is much scope for variation with wash and line. Some prefer to lay washes first and then draw with the pen, a very effective exercise when the work has gone slightly awry! 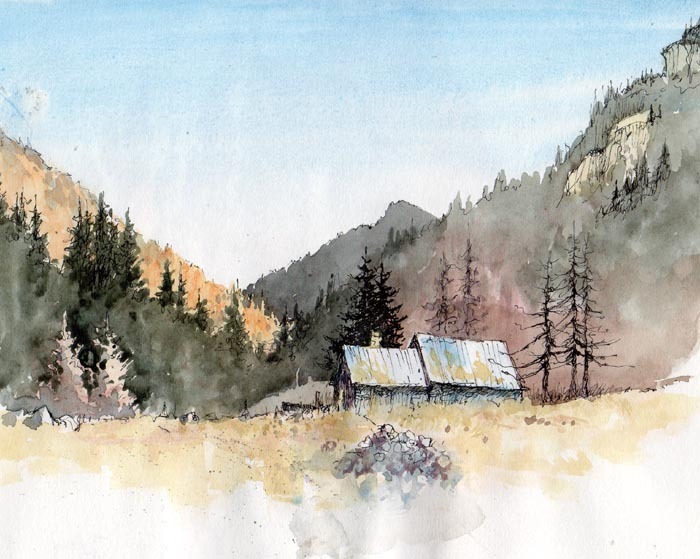 This was actually a sketch done on smooth cartridge paper, but you might like to try it out on hot pressed watercolour paper. The scene is taken from my book, Skies, Light & Atmosphere, recently published in the USA, and we are doing a special offer with the DVD of the same title on our website. The DVD is only available from us and all details are available on the site. 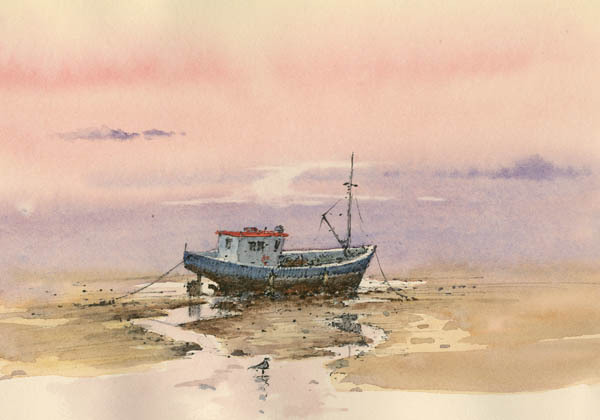 ….and don’t forget to have a go at the pen and wash!